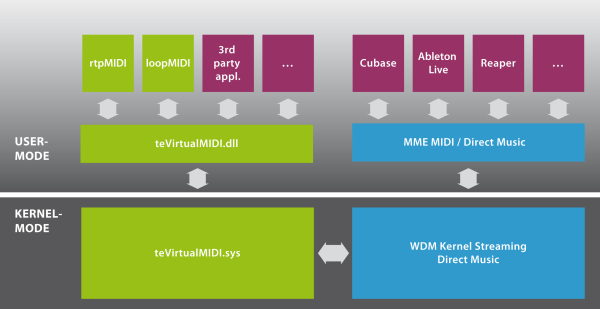 VirtualMIDI SDK (Software-Development-Kit) – THIS IS NOT AN APPLICATION meant for end-users, but a library and code-samples to show developers how to dynamically create and destroy freely nameable MIDI-ports using my virtualMIDI driver. This SDK includes bindings & some simple samples to help developers create virtual MIDI-ports on the fly from programming-languages like C, C++, Delphi, C# or Java. This SDK does not contain the actual driver but needs a pre-installed loopMIDI or rtpMIDI application to use the driver that is being installed with those tools. For licencees, a MSI-module is available to integrate the actual driver into the setup of their applications. You may use this SDK to evaluate the integration of the virtual MIDI-driver into your our own applications. This software is NOT freeware or shareware. This software is copyrighted by Tobias Erichsen. Software linking to this SDK MAY NOT BE DISTRIBUTED in any way without prior clearance with me (Tobias Erichsen). For questions concerning distribution, licencing etc. just contact me by email. Please provide a small description of the project you want to integrate virtualMIDI into!